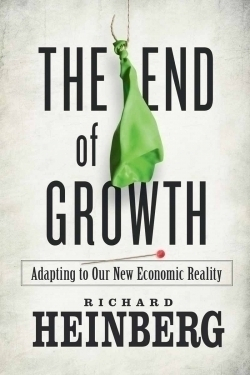 In his new book, The End of Growth: Adapting to Our New Economic Reality, Richard Heinberg moves the discussion beyond the validity of Peak Oil as a theory to explore the emerging challenges of measuring an economy that can no longer depend on unlimited supplies of fossil fuels, or any other natural resources. Heinberg, a Peak Oil expert and Senior Fellow-in-Residence at Post Carbon Institute, has spoken and written extensively on this topic. His book The Oil Depletion Protocol won ForeWord magazine’s Gold Environmental Award in 2007. The End Of Growth marks his tenth published book. Before launching into what will or may happen, Heinberg builds a foundation that examines the impact of fossil fuels from the dawn of the industrial age to the present. His methodical style, careful application of graphs and sidebars, and his ability to breakdown complex ideas into lay terms without oversimplification makes his writing popularly accessible. His extensive citations create an excellent map for those with more than a passing interest who wish to read further. Regardless of where one stands on the Peak Oil debate, it’s impossible to ignore Heinberg. Rather than shouting wild predictions of chaos and doom, The End of Growth offers a well considered study of the problems facing today’s markets and offers possible ways to adapt to an uncertain future. He says it best in closing, “We will be tempted to waste time apportioning blame for the failure of our existing economic and industrial systems, and venting anger over the greed and stupidity that stand in the way of building a new economy. None of that will help.” What will help is what he offers: fresh ideas and a willingness to move beyond the argument to find solutions.